Camp New Hope is a year around recreational experience for those 8 years old and above with developmental and physical disabilities. 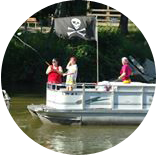 Camp New Hope lies on 41 rolling acres on the shores of Lake Mattoon, which bring campers the excitement of fishing, and pontoon boat rides plus much more. Our shoreline and chapel are serene spots to gather for activities or just to relax. Our AED-equipped facility includes a three-foot swimming pool, a mini-golf course, easy access asphalt trails, a playground, and the Camp New Hope Train. Cabins are air conditioned and our beautiful respite building features a large basement for activities of all sorts. Staff to Camper Ratio: Camp New Hope is unable to provide 1:1 camper assistance. The Staff to Camper ratios are: Respite – 2 staff: 7 campers; Summer Daytime – 3 staff: 10 campers; Summer Nighttime – 2 staff: 7 campers. Our Summer Camp Program is an overnight week-long summer camp experience. Camp weeks are offered in June and July (with one week of day camp the week of July 4), each with a special theme, special guest performances, and custom-themed activities. 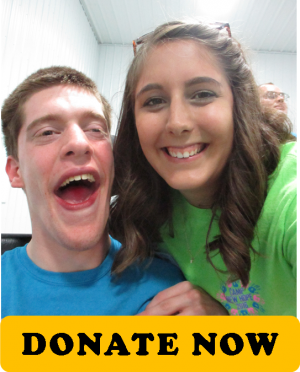 Camp is filled with art, music, and recreational activities, all adapted to individual campers' needs. Evenings conclude with group activities such as games, sing-alongs, campfires, and stories. Camp weeks culminate with an award ceremony for campers, parents, and families. Our Respite Program provides caregivers an opportunity to take a break from caring for their disabled loved one, while knowing they are in a safe, caring environment. Participants come to Camp New Hope's beautiful new fully accessible Respite Building instead of respite workers coming to your home. Respite lasts from Friday night 5:00 pm through Sunday 2:30 pm, with campers staying overnight and participating in camp-style games and activities. Caregivers can have up to 45.5 hours of continuous respite over the weekend. Take time to reconnect with your family members, spouses, and friends, or just take time for yourselves. Camp New Hope's Bowling Program is open to individuals with disabilities who are 8 years old and above. Bowling Programs are held at Charleston Lanes on Mondays and Mattoon Bowl on Wednesdays from September through April. 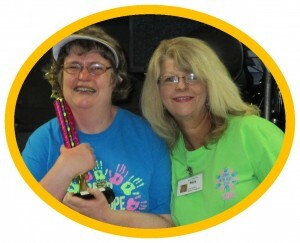 Participants see each other weekly, working on their bowling game and having fun! Bowlers scores are recorded each week so eligible bowlers can participant in Special Olympic bowling if they choose. Holiday parties are also held for Easter, Halloween, and Christmas at camp. Special guests, games, music, and yummy treats are all part of these activity-filled days.